Focus is problem identification software that assists therapists in decision making, documentation, and reporting. It is a computerized intake questionnaire that patients complete before seeing a clinician. Although it does not provide a diagnosis, it does gather information to support making a diagnosis. The client starts the first appointment with an interactive computer session that takes from 15 to 30 minutes. The software is so easy to use that no previous computer experience is necessary. The process empowers people by normalizing their problems, by engaging them in self-reflective thought, and by printing their responses for future reference. Often people are more open and honest with the computer because it is seen as non-judgmental. 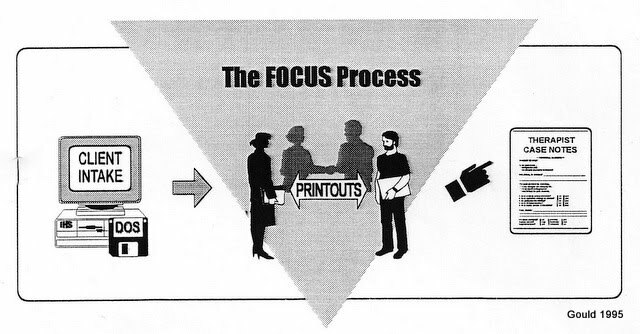 The first part of FOCUS is a thorough psychological intake. Depending on the client's response, the software may probe deeper by branching to another level of questioning. The second part enables the client to accurately define their current problems in living. After the interview, the client takes their printout with them. They should be encouraged to add notes and amendments to it and keep it as their tool to help them do their psychological work. The second copy becomes a source document for comprehensive case notes and treatment planning for the therapist to review and amend. When a person asks for help they do it because they cannot solve their problems in living. They become either incapacitated or somewhat immobilized by the distress and impairment that follows from being blocked and stuck. Bringing the source of the problem back into focus as a solvable problem is an important piece of psychological work necessary to regain health and well being. With this tool, much of that work can be accomplished. The Intake Questionnaire contains the following sections - however, the printout covers the problems in living section only, which includes unmet needs and personal goals along with some recommended next steps. The printout is formatted by potential diagnostic categories - If "high risk" data was selected then additional questions are printed as well as guidelines for the therapist. Our computerized intake served a triage function with special emphasis on symptoms, impairments, substance abuse, depression, psychotic disorders, danger to self, to others or from others. other therapists on the panel. Brief Decision Making Therapy is a more pro-active way of doing therapy that shifts the responsibility of action to the patient. Clients enter therapy having an unsolved problem and clinging to old ways of coping that don't work. Our approach is based on the concept of doing a unit of developmental work. That is, helping a person solve a problem by trying new behavior, and incorporating that new behavior into a safe definition of him or herself.